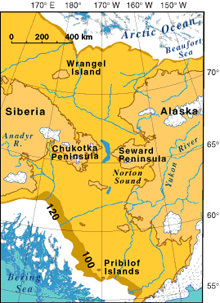 Map of the Bering land bridge during the late Wisconsin glaciation, when the global sea level dropped to about 120 meters (393 feet) or more below its present position. Click image for larger view. How people first arrived in the New World has been debated for almost 500 years without scholars reaching any kind of final resolution. The three most discussed possibilities for the route of this migration are: (1) across the Bering Land Bridge from Siberia to Alaska, (2) along the coast from Siberia to Alaska, or, far less plausibly, (3) along the North Atlantic ice-edge corridor from Europe to Atlantic Canada. Whatever route or initial point of entry to the New World might have been taken, though, it is now underwater. It is only by searching for early sites underwater that scientists will find the precursors to the early inland sites that have been found from Alaska to Chile. However old those inland sites may be, they must be younger than the underwater land that had to be crossed to get inland. Considering that the Western Hemisphere’s earliest sites must be underwater, it is important to also consider what people ate and how they were able to obtain that food, which in turn would have been profoundly influenced by what was available to those people at any given location. For example, the Paleoindian people whose 13,000-year-old culture was first identified near Clovis, New Mexico, appear to have killed and eaten mammoth, horse, and bison. As such, these people probably did not eat aquatic species such as oysters, nor did they need tools to pry them open. Conversely, earlier people living along one of the coasts, or nearby, would have had access to different resources — such as oysters — and would have needed different tools to utilize them. 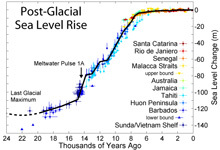 Sea level rise since the last glacial episode. Click image for larger view. The evidence for marine or even aquatic resource use at Early Paleoindian sites in North America is very limited: fish bones have been found at Shawnee Minisink in Pennsylvania, possible salmon blood is preserved on a Clovis point from the East Wenatchee Clovis Site in Washington, and a single flipper toe bone from a monk seal was recovered from Sloth Hole in the Aucilla River in Florida. Many other bones of fish, frogs, and turtles have been found at early sites, but often it is very difficult to determine if people actually ate them or if they happened to occur naturally at these sites. Evidence for the systematic or intentional exploitation of marine resources exists at only a handful of the early sites in North and South America. This means that the specific diet of the earliest people should have greater variety than we typically think about, but also their tools for capturing or harvesting that diet should be very different on or close to the coastlines of the Pleistocene. 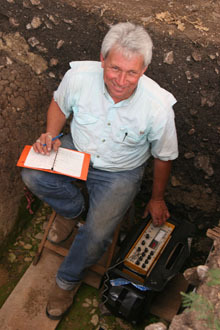 Dr. Jack Rink of McMaster University taking an OSL sample in the Pre-Clovis levels at Gault, Texas. Click image for larger view. These expected changes in diet and tools of the earliest peoples suggest that underwater archaeology on the Inner Continental Shelf holds tremendous potential to find not only better preserved materials (the perishables that typically deteriorate on land sites) but also holds the opportunity to document "new" kinds of tools, foods, and prehistoric lifeways. Considering how little archaeological work has been done in the areas that must contain the earliest sites, it becomes apparent that many of the fundamental building blocks of our understanding of the peopling of the New World — such as, who? when? how? and by what means? — have not yet been adequately addressed. Almost everything we know about the Colonization of the New World is information from sites occupied after the fact. Our information may only be a few years later, or it could be many thousands of years later. Our current understanding of Paleoindian diet and subsistence (the very tools used to procure that diet) is land centered in a way that is inconsistent with how people would have first arrived in the New World if they came along the coastline in places now underwater. Even if the Bering Land Bridge is how most people came to the New World, it is much closer to a wide range of marine resources than any of the other inland sites of the same time from across the Americas. This conundrum illustrates both the curse and beauty of scientific inquiry: As we have learned more and more about the first people in the Americas, we have come to understand we are in fact not studying the first people in the New World, but the people who followed them. The first people ate things and used tools that we have just not seen yet in the archaeological record from sites of the right age(s), and in the right places.